MSC Crociere Italiane is the cruise arm of the giant Mediterranean Shipping Co. the second biggest container ship owner in the world, with more than 200 ships in her fleet, only smaller than the Danish giant Maersk-Sealand. In the nineteen eighties, her owner, the Sorrento born Gian Luigi Aponte decided to diversify the business, and entered into the cruise industry with the purchase of the old Naples company Flotta Lauro. Later, he decided to buy three second hand cruise ships: first, the old American built Monterey in 1991, which wasn't renamed; then, in 1995, MSC purchased the Cunard owned Cunard Princess, this become the Rhapsody; and, in 1997 he bought the third cruise ship from Premier Cruises, the Starship Majesty, this become the Melody. However, there were few good second hand cruise ships in the market, and MSC needed to grow with more ships, which also had to be more efficient in order to compete with the other European owners. So, in Christmas 2000-01, MSC signed a contract with the French shipbuilder Chantiers de l'Atlantique to build two cruise ships, of 58,600 grt and a capacity of 1.560 passengers on lower accommodation. These ships share the same hull and technical installations as the Festival owned twins European Vision and European Stars. The contract price was 280 € each. The MSC Lirica was delivered late March and, in a glittering ceremony, the legendary Italian diva Sofia Loren christened the Mediterranean Shipping Cruises first-ever new build in the port of Naples on Saturday, April 12. But Chantiers de l'Atlantique had agreed to pay a €1m penalty fee to MSC on its latest new build MSC Lirica. MSC had originally requested a €3m penalty on the grounds that certain work had not been completed to the contracted design. Externally MSC Lirica is a ship of a cubic external pattern, fitted with a raking bow, and a transom stern, but has an imaginative funnel, far from the square one of the Festival twins. The superstructure aft design has decreased the angular image of the ship, with more rounded lines. 1. The MSC Lirica follows the pattern of the Festival ships in looking for a more humanitarian cruise ship size, far different from the latter RCCL and Carnival Corp. new ships. Evidently, these romantic considerations have little logic today in the cruise market, apart from the marketing side, and this means a lack of economy. But the MSC Lirica is a long ship: she has the same length as the Costa Victoria, but her breadth is 3.5 less than the Costa owned cruise ship. As a consequence, her gross tonnage is 18.000 tns. less. 2. All the cabins on board, both outside and inside (apart from the 132 suites with a balcony), have the same surface. Moreover, all the cabins are in the superstructure, away from the sources of noise and vibrations. Also, there are no cabins with the sea view obstructed by life boats. 3. As with almost all new cruise ships, the MSC Lirica features Mermaid azimuth propellers. As consequence, there is a low noise and vibration level in cabins, even with the thrusters in use. European Vision also utilises the IGBT converter technology. This gives a saving of 12 % in weight and size, plus a better output and economy over a conventional diesel electric installation. The MSC Lirica has eight decks for passenger use, all named after famous music authors. The architectural design of the European Vision corresponds to the Genoa firm Studio de Iorio, which has a strong reference sheet, full of cruise ship and ferry works, such as the latest Italian built Minoan ferries. Rafaela Aponte, wife of the owner, also has been involved in the decision making regarding both the interior design and all the onboard artwork. The salons and spacious public areas occupy 16,000 square metre. Her style is reflected in the carpet design, in the use of only two colours in the seating furnishings, or in the curved layout everywhere. Particular importance is placed in the carpet design, and there is a central theme throughout based on a Turkish design. Classic materials, such as veneered wood and marble are used extensively but also, to give a contemporary touch, in certain zones (mainly in the ceilings) modern materials, such as stainless steel, brass and resin have been used. The layout of the ship is rich, plenty of curved lines, and the circulation is very easy on board, and it is very simple to pass from one space to another. The predominant colours on board are brown, with garnet and green as secondary options. The result is a very coherent decoration (everyone notices this coherency), without strident clashes of colour. But she also has some disappointing features, such as the restaurants, which don't have the size or the volume found on other contemporary ships of rival owners, or the Nelson Pub, with violet stores close to a green decoration�and why there is an English pub in a "true" Italian cruise ship? But overall, I believe that the result is a warm, pleasant Italian atmosphere that is very adequate for a ship destined to the budget market. The finishing of the ship is excellent, such as in the latest deliveries of all European yards, due to the decline rate of vessel construction. On the lower deck for passenger use, Verdi (5) was found amidships of La Bussola restaurant, forward of the main galley, which was located on the after end. It has nearly 600 seats, and looks well due to her salmon, brown and garnet decoration. But compared with the European Vision and European Stars it lacks the height and has a crowded feeling. Also, the distance between tables is, in some areas, narrow, and the waiters have difficulties in serving. There are a lot of pillars and it is noisy. La Bussola features tables for 2, 4, 6 and 8 people seated in wood chairs with garnet upholstery and sofas both sides and around the funnel casing located amidships. The restaurant has an elliptical lay out around the funnel casing, with marble circulations. The inside area around the funnel had been raised to improve the passenger views. This space makes use of the full beam of the ship, with enormous portholes on both sides, with Venetian stories and a brown decoration between them. The central bulkheads are brown panelled, with some mirrors, to give a sense of height. The ceiling is richer than on European Vision and Stars, with stainless steel, pink and white circular and elliptical forms, and has halogen, fibre optics and indirect lighting in the sides. The existing lamps in the sides of the dining room have white lights. Forward of the La Bussola restaurant is found on the starboard side, the Rodeo Drive Shopping Arcade, with a semicircular lay out. All shops and boutiques are concentrated here, in only one area, with a marble floor and a stainless steel ceiling. Also, there is a duty free shop near the atrium. Opposite the stores, on the port side, is the Beverly Hills Bar. This space has a circular lay out around a piano and a white marble dance floor, and has a double use: as a meeting point before dinner, and as a live music lounge in the evening and night, offering classical music and consequently is not too noisy. The carpet here is brown and blue, and the sofas' upholstery is also blue. There is a little bar forward on the port side, and the whole area is comfortable and intimate. The lighting here has a splendid design, with a golden base and a growing circular glass lampshade, that is also found between the windows. It has 260 seats. Forward of the central stair tower is the reception area, around the main foyer or atrium, two decks high forward, decorated with the same carpet as the Beverly Hills Bar, but in green and brown tones. Also, the ceiling is pink painted. It features two counters: the forward one houses the classic purser's deck, and the opposite counter acts as the shore tour office, money exchange, etc. In the Festival twins is found here, on port side, a large Internet Cafe', and on starboard side, a shopping gallery; but MSC has choose a more open atmosphere, plenty of quiet sitting places, which work as an extension of the Beverly Hills atmosphere. I think the Festival integration choice is more interesting, because the boutiques work well in a great open space such as the reception hall, plenty of height. There is another major change in the atrium itself. On the MSC Lirica, a grand staircase has been added to aid passenger flow. This staircase shares the star in the marble floor, the mirror on the front wall (without fountain) and the circular shaped roof, etc. This space is designed as a meeting point, and works very well, because it is the first image of the ship that the passenger has when embarking. Also, this space is located in the lower deck for passenger use, and this fact also improves orientation on board, because all the cabins are upwards from the reception desk. The atrium size is smaller than others built on contemporary cruise ships; this gives it an intimate aspect. 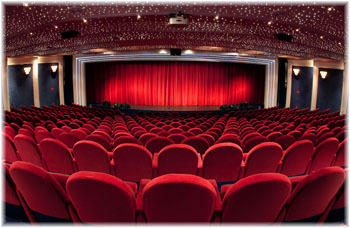 Forward of this deck is located the Broadway theatre, which is the only two decks high room on board and has a capacity of over 700 seats at one level. The arrangement is identical to the Festival twins, with entrances both sides on two decks. The theatre has a tiered seating disposition (without balcony), and is completely pillar free, with splendid views from any seat. The decoration is based on blue tones, with blue lateral bulkheads with golden and mirror details, blue carpet and a roof of imitation copper, while the upholstery is garnet. The illumination is spectacular: the ceiling has multiple fibre optics filaments, while the lateral bulkheads, contoured in vertical stripes to improve the acoustics, has indirect lighting. The sofas and chairs are very comfortable, and there are no tables. The elliptical stage is generous in size and has an orchestra pit. The slope of the theatre provided space to house the Nelson Pub, a place of English inspiration that is mainly decorated in dark wood and mirrors. The height now is low, and there is a round bar forward between two seating areas, located both sides, under the theatre. Both share the same Scottish themed tapestry, and have a nautical flavour, with golden lighting devices and sailing ship portraits. This is a large place, with 172 seats and is fitted with large rounded sofas and big chairs, both with green upholstery, etc. I think it is a inappropriate place considering that the Lirica is an Italian themed ship. 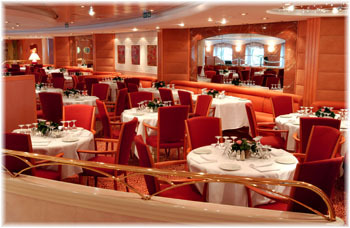 Aft of deck 5, or boat deck, is located the L'Ippocampo restaurant, of 296 seat of capacity. It has a "U" shape, and hasn't an outdoor section as on the Festival's sisters. The decoration is in green tones (both carpet and upholstery), but with rounded patterns that make this room very pleasant, but in my opinion, the salmon coloured Bussola restaurant has a better interior. Both sides and aft the restaurant has big square windows, with beige outlines, and has brown panels between them. The green floor has three different heights, which allows passengers to see the ship's wake. In this zone, the superstructure, due to the lifeboat arrangement, doesn't take all the ship's breadth. Because of this, from this point forward there is only a starboard inside passageway, through which the passengers can get access to all saloons. But the passengers can also use the promenade deck under the lifeboats. After crossing over the aft stairs, the passengers find two circulation routes. 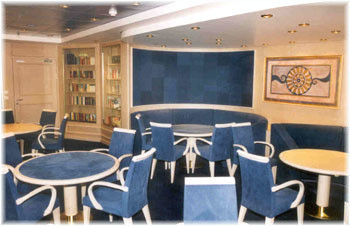 Port is the Cyber Cafe, with ten pc's located in a dark wood counter, separated from the circulation zone by a glass and stainless steel railing, while starboard was found the photo gallery, located out of the restaurant-theatre circulation of the passengers who use the main dining room. It has wooden shelves that convert it into an art gallery when the concessionaire closes the service. This space shares the same tapestry and carpet. Both passageways join forward in L'Atmosphere, a 120 seat space decorated in red, brown and garnet tones, with dark woods the same as Cyber Café and Photo Gallery. I think this space is one of the better decorated on board, with its rounded dark wood counter forward, ample green sofas and circular tables. It has a piano aft, above a small marble and glass stage. The forms of counter and sofas are repeated in the ceiling, which has a cream colour. The large windows are pink panes. The Las Vegas Casino is located port, out of passenger circulation. So, you must go looking for it. This is quite different to the last ships, mainly dedicated to the American market, where the passageways cross the casino, and the passengers cannot avoid it. This is the case in the Millennium, Costa Mediterranea, etc. 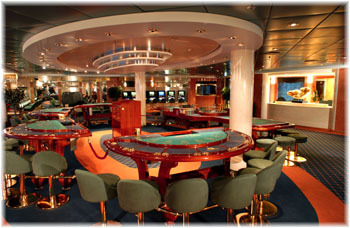 Nevertheless this is a pleasing detail; the casino is large, with six tables and a bar with green counter. This room is decorated in green tones in tapestry, ceiling, stores and furniture, with separate ambiences for slot machines. The decoration includes a sculpture called "Vuelo", from Noemi Sanguinetti in the entrance, behind a splendid green sofa. Forward, on starboard side, is located the blue decorated Library and Card Room. The tables here are circular, for four or more people, and as a consequence I think it works better as a card room, and the use as library will be residual, because it is not a quiet place. But on the Festival twins there isn't a dedicated library, and the card room is found inside the cabaret, on the seventh deck, an unusual move in a cruise ship. In the second deck of the atrium, is found Coffee Corner, an intimate café. It encircles the upper level of the atrium, with a wooden floor, a glass railing and brown and white walls. 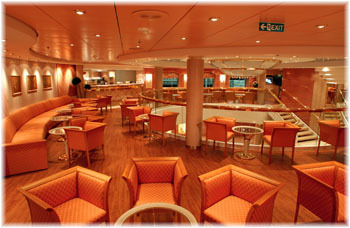 The semicircular bar is located port aft, and is a popular place for coffee and drinks throughout the day. The atrium stair makes a better use of this space, which is also a meeting point to enter the upper level of the theatre. On this deck, on both sides of the superstructure, is located the promenade deck, under the lifeboats. It hasn't any attractiveness: it is decked with AstroTurf, without chairs, etc. Many passengers will only come here for the life boat drill. Each evening there is a second show on Lirica Lounge, located forward on deck 7, on top of the theatre. This big space (with 458 seats) works as a night club, with a circular dance floor with a marble made trefoil motif. It offers live music to prolong the entertainment after the end of the theatre performance. The decoration is mainly in blue and brown tones and the lay out is new with plenty of rounded details: semicircular sofas, a lot of circles in the ceiling, etc. The lateral zones of this space are raised from the centre, to improve views. There is a bar on the port side, with a rounded counter, and a seating area starboard, with a lot of mirrors. This area would be better located on a lower deck, inside the hull, as on the latest Finnish built Costa ships. The day activity is concentrated overall on decks 11 and 12. On the aft deck 11 (Vivaldi) is located Le Bistrot, a "U" shaped buffet around the funnel casing, with nearly 300 seat capacity. It has three buffet lines (port, starboard and aft), and is decorated in brown tones, with a lot of wood, an unusual material for this type of space. The passageways are of marble, and the seating zones are a wooden base. Also, the inside walls are made of wood. This area permits magnificent views over the wake of the ship thanks to a float glass system which provides an uninterrupted, continuous glass wall. The furniture is splendid, wooden made, with excellent brown sofas and wicker chairs. I enjoyed mainly the mosaic decorated tables. I think the only problems are the drink stations, situated too far aft and the acoustics, very poor. There are automatic doors forward, toward the pools, but not aft, due to the lack of an exterior section here. Also, the size is modest, and will be cramped in the day time, mainly on sea days. The whole capacity of the four restaurants of the MSC Lirica is 1,686 seats, a small figure when the ship sails with a full complement. 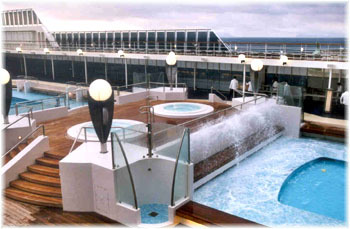 The open sun deck area is divided into two parts, because the central stair reaches this deck, and the lift and stair tower divides the lido deck, and thus separates both food and pool areas. The roof of this tower can be used as a stage for an orchestra. Aft of the central lifts is located La Pergola, an outdoor restaurant and bar which compensates for the lack of an outdoor section on the buffet and basically expands the dining time to 24 hours. It has counters both sides, port for pizzas and starboard for grill beef. Forward there is an ample, wood decorated bar, well used by sun bathers, with a lot of teak tables, protected from the sun by the largest canvas awning made in France. All the furnishings are made of wicker and steel, and the roof, which imitates teak, is made in Astroturf. It's very well sheltered from the wind. Forward is located the sun deck, with two big pools of 13 metres in length, each one with two depths (children and adults, this latter has a length of 9 meters), between them are located two jacuzzis, placed on a raised zone. At the side, there are floor to ceiling windows, fitted with a new system developed by Chantiers de l'Atlantique. This technology has been used before on land, but never transferred to the sea. The float glass system provides an uninterrupted, continuous glass wall, with joints of only 10 mm. The glass panels are individually hung by means of Pilkington bolts and are independent of the vibrations and torsions produced by the hull. The lighting devices are white globes, and there is a small fountain in the aft pool, which works during the night. The lay out is very similar to the Festival twins, with teak floors around the pools, and a white and blue plastic around the zones close to the ships side, under the sun deck. This pool arrangement works very well, and offers a lot of open space. Forward of the pool zone is located the La Canzone del Mare pool bar, with a wood counter fitted with raised seats. Also, there are also an ice cream parlour and a hot dog burger bar both sides. All the furnishings are wicker and metallic made, and the tables and some chairs are teak made. But this deck lacks the sophisticated design details found in other ships, such as statuary, fountains, etc. Forward of the lido deck is the blue decorated gymnasium and the Lirica health centre, up to the wheelhouse. It is divided in three sections, all accessible from the "U" shaped lobby. The beauty salon is located starboard, with the massage rooms. In the centre, behind large panoramic windows, is the gymnasium, which has exercise machines oriented toward the bow, and the aerobic zone in the interior. Lastly, on the port side, is found the sauna, the Turkish bath, the thalassic zone, mud baths, etc. Also there is a relaxation zone, with a small bar, located on the port side. This area is one of the Achilles' heels of the MSC Lirica: it is small, and lacks the space and sophistication found in other comtemporary cruise ships. I think it's functional, but never spectacular. This section also houses the children's day room, I found portside, a cr�che small, but beautifully decorated in blue tones, and managed by professional nurses. MSC looks for the family market and the ship has plenty of installations to entertain all family members, independent of their age. Aft deck 12 (Ponte Rossini), around the funnel, is located The Blue Club. Her lay out is similar to a Crows Nest of an RCI cruise ship, surrounded on three sides by picture windows, and a decoration made mainly in stainless steel and navy blue and green carpet. The inside zone has more headroom than the outer one, and thus gives more sense of height. It's large and spacious, and well decorated and also has an ample bar of semi circular shape, made of stainless steel with a blue marble top. The circular dance floor is also made in blue marble, and has a raised table around it. Forward of the disco, on the port side, there is a virtual reality games room, dedicated to children, but widely used by her parents. Amidships of this deck is located the jogging track, which encircles the pools, and also serves as an additional sun bathing zone. MSC also caters for the sportsman and energetic passenger and has therefore installed a mini-golf course around the funnel, on deck 13, with sticks and balls free, but lacks the non-aesthetic full size volley court, aft of the funnel on deck 14, as on the Festival's twins. De Jorio redesigned the funnel, and submitted 15 different stack proposals to MSC. The choice is a rounded one, with the MSC logo located in the centre. The MSC Lirica has a capacity of 2,065 (all berths). All 780 cabins are located on the superstructure, and are doubles, and a high percentage having also a third pullman type berth. 372 face the sea, through large widows, and 276 are inside cabins. 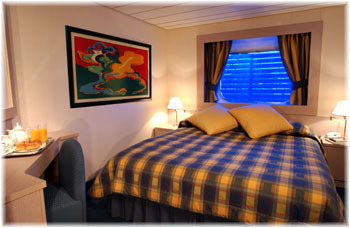 The cabin décor is upscale for the ship sector, with soft green carpet, ample wardrobes, a sitting corner with a mirror, and a corner with TV and minibar. All cabins have satellite telephone. The extensive use of mirrors enlarges the cabins, and this is a good design decision, because the cabins are not big. The bathroom is also tiny, but has all the standard fittings that the passenger can expect. The MSC Lirica also has 132 cabins with private balcony, located on deck Bellini and Rossini. Each has a double bed, two chairs, a full marble bath and a walk-in closet and a safe. The vertical circulation in MSC Lirica is the best in modern cruise ships, with four main staircase and elevator towers, each one with two elevators (center and aft) and three elevators (forward). These towers travel to all passenger decks (including the pool), which makes on board orientation easier. The MSC Lirica heralds the start of a new phase of expansion for the Naples based cruise line. Gianluigi Aponte, owner and founder of the parent company, Mediterranean Shipping Company, confirmed that, after the delivery of Lirica's sister ship, MSC Opera, next year, the line "would be building at least two more vessels to replace the older Monterey, Rhapsody and Melody". Aponte plans to harmonise and upgrade the fleet, "as it will be hard to sell two different products, older ships versus the newer". He also aims to make MSC a more high-profile player in the European cruise market. Amidst competition from the bigger corporations, Aponte believes "there is room for the smaller companies" and is confident of success with the new MSC Lirica and future new buildings. Aponte also emphasises the authenticity of the company slogan: "Cruising as only the Italians know how", saying "it's because we are a truly Italian company, with a true Italian style". MSC carries about 40 % Italian passengers, 30 % German and 17 % British. Whilst Chantiers presses ahead with MSC's next new building MSC Opera, due for delivery in spring 2004, competition has already started between the French shipyard and Fincantieri to secure a possible future MSC order. Although MSC owner Gianluigi Aponte made it clear he is not in a hurry to order, it is widely believed in the industry that it could only be a matter of months before he places a contract for two more cruise ships. There were some rumours that, following an inspection of MSC Lirica, Fincantieri sent an offer for a better design specification at a cost comparable to the reported price of €250m. However, the Italian yard would not be able to deliver any possible MSC ship before late 2005/early 2006. On the contrary, Chantiers can build a sister to MSC's Lirica and Opera for delivery in spring 2005, a big negotiating advantage over her Italian rival, if MSC wants another new building ready for deployment at the start of the 2005 summer season. The growth of Costa in the last few years, which will double the capacity of her fleet up to 20,000 passengers, will oblige MSC and other European owners, such as Festival Cruises, to sign new cruise ship orders. Also, MSC own three old cruise ships that soon will not be competitive due to technical and marketing problems. So, it is believed that the MSC growth process, both fleet renewal and organic growth, will be financed by their own funds. Also, the purchase of another owner is always an open option. Aponte and Poulides share a common vision against monopolies and the potential to abuse a dominant position. Also, the new MSC sister is more or less the same as the European Vision and her sister. This would allow both fleets to share a technical base with a reduction in maintenance costs, better crew rotation etc. With this ship, the MSC fleet increases by 67 % and next year the sister ship MSC Opera will give the company an even larger capacity. Last year, 120,000 people sailed on the MSC cruise fleet, and the MSC Lirica is the first consequence of the MSC Cruises expansion. She sailed full for the entire summer season after her first cruise, which began last April 13 in Genoa. The question now is: at what time will the third ship for the Aponte cruise fleet appear ?